I’ll get in to the “why”s shortly, but let me first explain why I wear the type of helmet that I wear. With all of the different styles of helmets out there, it doesn’t make sense to wear one that’s hot, uncomfortable, heavy, or doesn’t fit well. I think the typical “skater” helmets are unfortunately guilty of all of those faults. Other, cycling helmets are usually lighter, have better ventilation, and have great fit through adjustable retention systems. 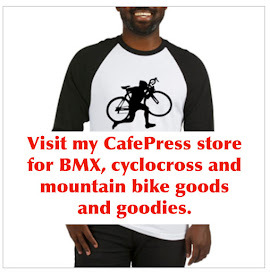 As a mountain biker/road cyclist/cyclocross racer, I’ve got plenty of different styles of helmets to chose from, and I chose a comfortable one for BMX. Sure, it’s not the fashionable one that, if forced to do so, other BMX’ers would wear, but I’ve got this thing called “independence” where I don’t need to follow trends or submit to the constraints of what everyone else is doing. If I did, I’d be wearing skinny jeans and riding with a hat that would fly off with every spin or twist. And what fun would that be? 1.) I’m not a hypocrite. 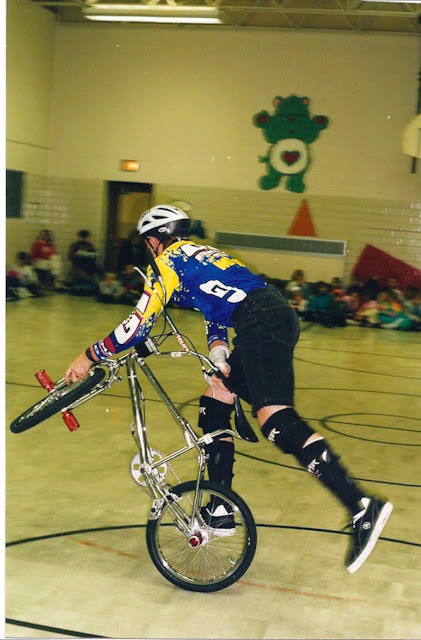 I’ve done hundreds, maybe more than a thousand, bicycle safety and anti-drug shows across the US. I’ve stood in front of tens of thousands of kids and proudly stated that I wear a helmet in an effort to promote safer cycling. Yeah, I know helmets don’t prevent all injuries, but you can’t argue that they can make any injuries worse right? Anyway, I still take those shows and those messages seriously. I encouraged the audience to wear helmets, and I’ll still live up to that. 2.) I’ve seen the damage head injuries can cause. I work in an emergency department, and I’ve lectured extensively on traumatic brain injuries, from minor concussions to life-threatening intracranial hemorrhages. I know the physics and physiology of these injuries, and I know the after-effects. I know that even minor injuries can have devastating long-term effects. Sometimes even minor cognitive or personality changes can occur which can be present for years or more. People can walk away from a skull fracture with serious brain injuries with no long term deficits, or people can have a couple of minor concussions with a life-time of headaches, increased risk of depression and seizures. 3.) I’m not that good. Seriously, my riding skills are mediocre at best. I love to ride, and I hope to continue to ride as long as I can, but as I work hard to progress (ever so slowly), I’m going to hit the ground. I’m at a point in my life where I’d like to prevent as many injuries as I can (without going over board). I’ve got a mortgage! 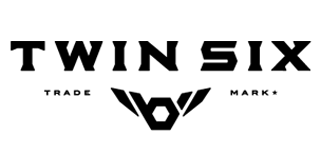 So, shin pads? Yep. Gloves? Usually. Elbow or knee pads? I’m okay forgoing those… Helmet? See above. 4. Why not? Yeah, I think the chances of me falling in a manner that I could sustain a head injury are low (I hope I didn’t just jinx myself), and yeah, I know that helmets don’t guarantee that there won’t be an injury, but if a few ounces of foam and plastic might help, why wouldn’t I wear one? In reality, I'm going to guess that it's only my fellow BMX'ers that would wonder why I'm wearing a helmet or even discussing it. Just about everyone else, both cyclists and non-cyclists, would probably think it's a given. I'm not trying to influence anyone, just voicing an opinion. Good stuff, Dave. Glad to see you're teaching people about the importance of the brain bucket. Having hit the ground hard myself a few times, I'm convinced that my helm prevented more serious injury.